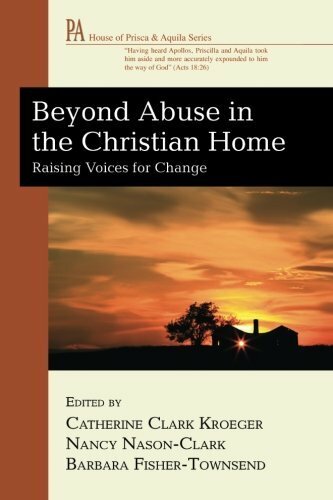 Beyond Abuse in the Christian Home is a compilation that gathers, from many different perspectives, essays providing insight into the difficult problem of domestic abuse. Whether a reader is a pastor or church leader, law enforcement officer, court actor, therapist, teacher, or a friend or neighbor working with or acquainted with someone who is experiencing domestic violence, Beyond Abuse will either soundly initiate an awareness of this epidemic, or it will serve to deepen understanding even if one is already steeped in knowledge about domestic abuse. Who better to edit this book than three highly respected scholars who are well seasoned in this issue? With many faith-based essays written by different authors of various professional backgrounds, Beyond Abuse provides information and perspectives from people who cross over numerous disciplines, including, but not limited to, psychology, sociology, theology, and counseling. Even batterers provide their picture of what they believe took place with their victims, but the most important perspectives include those of the survivors. Why is Beyond Abuse a book that the bulk of the adult population would do well to read, whether attached to a Christian community or not? Aside from being a highly informative, well-written book, there is one overarching reason: Domestic violence pervades each of our communities and, consequently, involves each one of us, whether we personally know someone who is a victim of abuse or not. We are affected not only by the batterer and the difficulties experienced by the victim, but also by the children of the victim. Compared with children who do not witness family violence, children who do witness partner abuse on their mothers are at considerably greater risk for many personal and family problems as well as psychological, educational, and social difficulties. These in turn impact the greater community. Beyond Abuse shows the reader that helping the batterer is helping the victim by creating a positive, systemic change when successful. While there are many statements supporting the fact that domestic violence does not come from a vantage point of anger, but rather manipulation and calculation, there are places in the book that allude to the idea that domestic violence is precipitated by anger, as in chapter 2: "May we have a dialogue about the issues of abuse that begins with an awareness that every human being struggles with anger...." (33) Understanding that domestic abuse is a problem that springs from calculated management and not merely a problem emanating from anger is profoundly important if one is to understand domestic abuse properly. An abusive person generally has the ability to control actions and display cruel behavior in deliberate, manipulative, and powerful fashion. Along with relaying statistics, introducing resources, and showing understanding toward the victims of domestic abuse through noting common occurrences within families experiencing it, this instructive collection of writings also encourages us to realize that batterers can be supported in their endeavors to change their behaviors. In Beyond Abuse, readers who know of or who endeavor to care for those who experience domestic violence receive essential information as well as deeper insight into family abuse and what our more effective, healing response should be for both victims and perpetrators. The authors exhort the Christian reader to gain knowledge, and they provide the kind of redemptive guidance to abused women one usually has to seek from the secular community. Given the common occurrence of family violence and the resulting systemic problems that pervade our communities, Beyond Abuse is a must-read.